Filed to: Worms!!!!! !Filed to: Worms!!!!!! After floods hit Denison, Texas last week, park rangers were mystified to find stringy clumps dotting the rain-soaked streets in inexplicably organized lines. It was no pasta-based après-flood prank. It was just piles of living, squiggling worms. Eisenhower State Park Superintendent Ben Herman told ABC News that rangers aren’t sure what’s up with the worms. “Even our biologist doesn’t know why they’re spaced so well and in the line,” he said. They do know that the writhing piles of cylindrical tubes are definitely worms. So many worms. 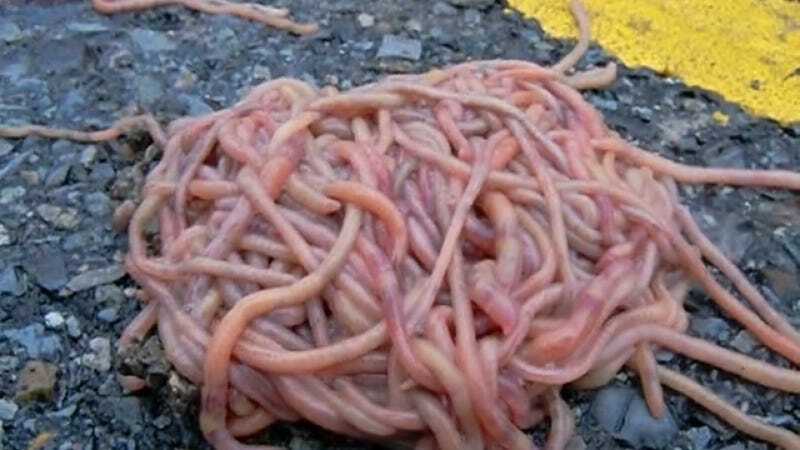 Rangers decided to poke the piles with a stick to ensure that there were only worms in the spaghetti-looking clumps. The rangers have a few theories about why exactly the worms chose the “WormKing” approach to storm survival. The worms may have simply crowded into the driest bits of pavement, or they may have clumped as a defense mechanism after mistaking the sound of rainfall for an approaching predator. Earthworms do gather in herds when threatened, so that makes sense, but the neatly-lining-up-thing is still unexplained. Texas dealt with 35 trillion gallons of rain in May, so that’d be one hell of a predator. It’s not clear why the worms arranged themselves in such an orderly fashion (German worms?) but no other parts of Texas reported the same nightmare-pasta worm piles, so this is a very location-specific eumetazoa mystery. As quickly as the wiggly visitors appeared, they were gone. Herman says the worms stayed for two days. “It was pretty entertaining to watch the worms do their thing,” he told ABC News.